Men’s Champion Nuwara Eliya team with the trophy. 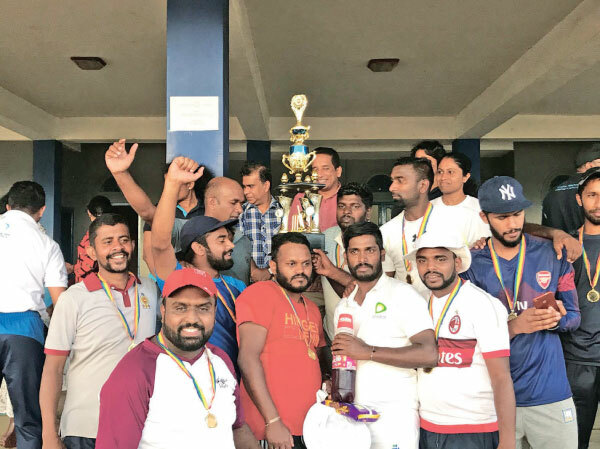 Nuwara Eliya and Walapane divisions won the men’s and women’s championship respectively in the District Secretary Challenge Trophy limited five-over cricket tournament which was held at Dunbar grounds, Hatton recently. Kotmale team emerged men’s runner-up, while Nuwara Eliya team became runner-up in women’s tournament. Indika Lakmal of Nuwara Eliya won the men’s Best Player award while Deepthi Wathsala of Walapane team was adjudged the women’s Best Player. The tournament was organised by the Ambagamuwa Korale Divisional Secretariat. The tournament saw teams from Ambagamuwa Korale, Walapane, Kotmale, Hanguranketha, and Nuwara Eliya district secretariats battling for supremacy. Nuwara Eliya District secretary Rohana Pushpakumara and Ambagamuwa Korale District Secretary R.T. Pradeep Sumanasekara presided over the award ceremony.